Reflux and indigestion affects millions of people’s lives every day with one in ten adults experiencing reflux every week. For some, the symptoms of reflux and indigestion may only be mild with only a slightly uncomfortable sensation in the stomach or the occasional regurgitation. For others the pain can be more severe and quite disruptive. Although the symptoms may be mild, your body may still be suffering damage. When you swallow, food passes down a long tube between your mouth and your stomach called the oesophagus. Your digestive system has mechanisms for allowing food and drink to pass into your stomach, and prevent it from coming back up. When these mechanisms don’t work properly, your stomach contents can squeeze out of your stomach and back up into your oesophagus. When this happens, the acid and other secretions that normally digest your food actually burn and begin to digest the lining of your oesophagus; this is what causes the burning sensation that is so irritating for people with reflux. If this happens often enough, the tissue may become so damaged that it becomes ulcerated. Are you fueling the fire or dousing the flames? 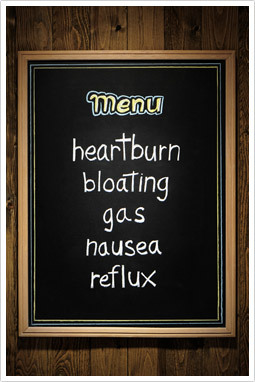 Many things can cause reflux or make it worse. These include eating too fast or overeating, eating spicy or fatty foods, stress, anxiety and emotional trauma, smoking, drinking excessive coffee, cola drinks or alcohol. Reflux may also occur as a symptom of more serious conditions such as Helicobacter Pylori infection which we can discuss at your consultation if you are concerned and consider testing options to rule this out. Taking time to relax and enjoy a leisurely meal time. Reducing the amount of caffeine you have by cutting back on coffee, tea and cola drinks. Have a break from alcohol for a while or at least reduce your intake. Avoid taking aspirin and anti-inflammatory drugs if possible as these increase your risk of ulcer. If these were specifically prescribed for you, discuss your requirements before you stop using them. You can also talk to us about effective alternative anti-inflammatories that are gentle on your digestive system. Naturally soothing and healing remedies that hit the nail on the head! Imagine getting lasting relief from the irritating discomfort or pain from reflux and indigestion! While natural medicine takes a wholistic approach, it is interesting to find that subtle differences amongst nutrients and how they are prepared dramatically improve their benefits. For example, zinc is a mineral that is important for wound healing, but when it is given in the particular form of zinc carnosine it specifically adheres to inflamed wounds or ulcers in the digestive system. This provides more targeted healing for gastric ulceration than other forms of zinc. Zinc carnosine also differs from other forms of zinc in that it actually inhibits Helicobacter pylori, the bacteria that is associated with gastric ulcers. Other forms of zinc do not have these specific benefits. Another example is soy protein. We have known for years that soy may assist in the management and prevention of a number of diseases including cardiovascular disease, menopausal symptoms and osteoporosis. Yet when soy protein is prepared in a particular way, by fermentation with L. delbruekii, it takes on remarkable new properties for gastric healing! This type of fermented soy protein can heal the gastric lining giving fast relief from heartburn, nausea, bloating and most symptoms of gastric ulcer. MNMC Naturopaths can support you in making simple dietary and lifestyle changes that will address reflux and indigestion. We can also provide you with a simple new supplement that has been designed using the above ingredients to specifically treat reflux and indigestion. This product can give relief from reflux and indigestion within 10 minutes of taking it. Please phone to make an appointment if you would like support to achieve relief from reflux or any other of your health concerns. As highly qualified Natural Healthcare Practitioners, we can help you make simple dietary and lifestyle changes that will address reflux and indigestion. You can make an appointment online, email us, or phone us on (03) 96862566. Our clinic in 49 Chetwynd St, North Melbourne, is open six days a week.